With many growers looking to make up for low yields over the past few years, it is important growers and agronomist maintain a focus on new and evolving threats to crop yields. In 2006 for the ﬁrst time in a number of years, significant levels of Stem Rust was found through out parts of the Australian Wheat belt. As a result growers and agronomists are advised to be on the look out for Stem Rust this season. Stem Rust can result in severe cropping losses (50 – 70%) over large areas. In some instances a crop can be totally destroyed. Infected plants usually produce or maintain fewer tillers, set fewer seeds per head and yield small shrivelled grain, resulting in reduced test weights and milling quality. 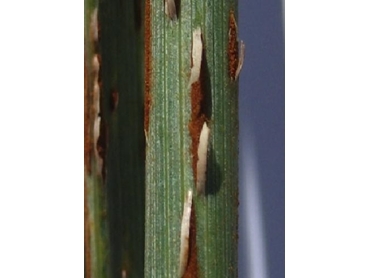 Stem Rust has reddish – brown, powdery, oblong pustules that are easily dislodged and can appear on both sides of the leaves, stems and on the glumes. Surrounding leaf and stem tissue is often ruptured by the disease and will as a result have a torn appearance. As the plant matures dark brown – black spores are produced. Stem Rust is some times confused with Leaf Rust; however, Leaf Rust produces lighter coloured spores in smaller round pustules, which mostly develop only on the upper surface of the leaves. Stem Rust survives on volunteers and is spread by wind and rain splash. The disease cannot survive on stubble. Hosts include wheat, barley, triticale and many other related grasses. Stem Rust development is favoured by warm to hot days (20 – 30°C) and mild nights (15 – 20°C) where there is adequate moisture for night time dews. This result in Stem Rust being more active in the warmer parts of the cropping season compared with stripe and leaf rust. It is important to note that the level of resistance expressed by varieties to Stem Rust can be significantly different to the level expressed for stripe and leaf rust. Stem Rust is more difficult to control than Leaf and Stripe Rust. Most products currently used for Stripe Rust control (including seed and fertiliser treatments and foliar fungicides such as Impact, Jockey, Triad and Opus) are not registered for the control of Stem Rust. TILT XTRA, available from Syngenta , is one of the few products registered for control of Stem Rust and the recommended foliar fungicide for all Stem Rust situations, because it contains two active ingredients for improved activity. Cyproconazole is one of the most systemic triazole fungicides and is recognised internationally for providing good control of all rusts in winter cereals. Application timing is critical in managing Stem Rust. Stem Rust activity needs to be closely monitored both in individual paddocks and across regions. TILT XTRA must be applied at 500ml/ha at the first sign of disease. Applications should be made ensuring thorough coverage of the stem and leaf of the wheat plant is achieved. A follow up spray may be necessary 3-4 weeks later, if conditions continue to favour disease development. Preventative applications consistently provide better results than applications made after disease infection has occurred. Unlike Stripe and Leaf Rust, foliar fungicide applications targeting Stem Rust must be applied as soon as the disease is detected as opposed to targeting key yield determining leaves. Failure to do so will increase the risk of significant yield loss.